Lift food using ants with the help of a slanted stick. 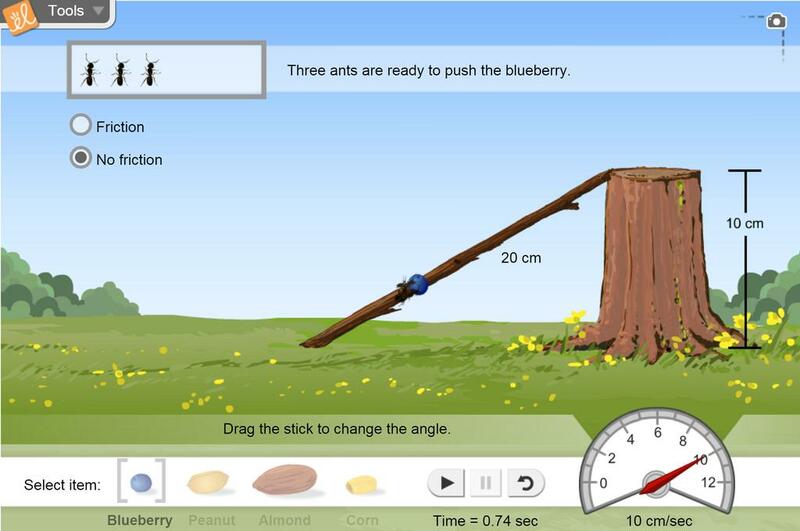 The steepness of the stick, the number of ants, and the size of the item being lifted can be varied. Observe the effect of friction on sliding objects. Understand that an inclined plane supports an object by pushing up on it. Discover that inclined planes help make lifting an object easier by combining their supportive force with the lifting force applied by whoever is pushing the object. Relate the length of the plane to the reduction in required force. Be aware of disadvantages of inclined planes. Discover that friction causes work (energy) to be wasted when sliding objects. Identify types of simple machines by matching vocabulary to snapshots from the Gizmo. Good for the emerg... (more)ing 3rd grader. enjoyed the gizmo tremendously. The kids enjoyed the kid-friendly interface.